WHAT IS CLIVE GENERAL STORE AND MUSEUM? Keeping the history of Clive present for today’s generation to learn from the past and to guide us into the future. Sciena Swanson moved to the community that is now Clive in 1911. A widow and single parent, she built a house that became a general store. Sciena and her children operated Swanson’s General Store until 1929. The store also served as the community Post Office from 1912 to 1929. Being a post office made the General Store a popular community gathering place. A narrow gauge train ran from Des Moines and stopped at the community starting about 1882. It was replaced by a standard gauge railway a decade or so later. The passenger commuter service took workers, shoppers and high school students to and from Des Moines daily. A reconstruction of the RR depot that was on the South Side of Swanson Blvd. was built by Ed Emory. A railroad caboose was donated by the Milwaukee Railroad, about 1991-92, and is a fun place for children and railroad history buffs to play or study. See the Gallery page for pictures. Scennia’s daughter, Mildred Swanson, gifted a fund before 1991 probably with the intent that it be used to maintain the family property. There were no restrictions on the funds so the City was responsible for their use. In 1988, several concerned citizens of Clive met and discussed the fate of the railroad depot located at 86th and University Blvd. With this discussion, a historical society was formed and Articles of Incorporation were drafted and filed with the Secretary of State in early 1989. In October of 1990, the Historical Society’s Board of Directors met and adopted By-laws for the society. Preservation of Clive’s history and the restoration of the Clive Depot and Swanson General Store in Swanson Memorial Park were the first projects completed. They are available for education and interpretation of the Clive “community.” All the structures are ready for artifacts indicative of the late 1800s to late 1920s. For more historical information, please visit our Clive History webpage. Please visit our various website Galleries above. » Clive Cultural Festival – CHS celebrated our heritage day on June 4, 2016. About 200 people attended and enjoyed cultural dancers, DJ, games for kids and free food. » Labor day – CHS will have an event inviting dignitaries, Swanson Museum members, Clive Community citizens and businesses to celebrate the labor that built Clive. » The campus is available for community groups to organize and present events. » Clive Recreation and Clive Library are planning events at the Campus for the Spring / Summer seasons of 2017. Past, present, future; these are the elements that move the Clive Community forward as together we shape our future. 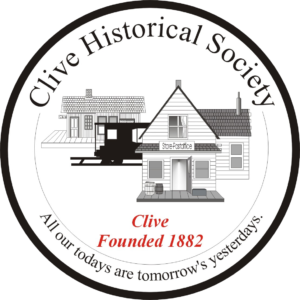 Clive Historical Society (CHS) promotes the collaborative application of time, talent, and skills together with ongoing dialogue to help guide the growth of our city. Engage in CHS events to help shape the future of Clive. History makes a difference in defining who we will be in the future. You are an important part of that future. Be a force for Clive as we change naturally.